15 of us gathered at Yad Labanim with a couple of new faces in the group. Welcome and do join us again! We set off on one of our regular routes with very few sandy patches and enjoyed a 27 km ride with only one mishap - a puncture for Avraham. We refuelled at our our Ga'ash stop and, despite the predictions, it wasn't too hot as we had some wind to help us a long. Avi and David were in constant contact - Avi wanted to hook up with us, and eventually did, after he had ridden 35 km in a round-about route to get to us. It reminded me of David Bowie's Space Oddity: Ground control (David) to Major Tom (Avi).... What is even more appropriate: Take your protein pills and put your helmet on. Now that is advice that we can all take. It is the end of the Passiflora season - so it was slim picking for our regular long-fingered friends. 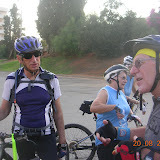 In the early hours of Saturday 15 of us were ready next to the Tzomet Ra'anana Trampiada for a new adventure near the Palmachim Beach lead by David. At 7 am after we parked our cars at the beach we started to ride towards the unknown. Shortly we turned off the paved road and entered a firing zone, as was pointed out by Megan, but that really didn't bother us. We just carried on riding with a bit of sand here and there towards Yavne's lovely bike route and almost ended us up on the route to Jerusalem - as remarked by some locals we met on the way. So we turned around after some discussions and checking the map to find our way to the Soreq River, whatever's left of it, while Megan was taking pictures of us. We even managed to do a dry crossing on a stone bridge. On the other side of the river we had a short break to refuel ourselves with snacks, fruit, nuts and water. What we didn't know was that sand dunes were awaiting us along the road so even the better and stronger of us has to push the bike. Altogether we rode and pushed 27 km. It was most rewarding to plunge into the sea after the ride though only four of us took to the water. Perhaps we should try this route again during the winter or spring. 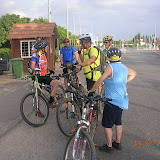 15 of us gathered at Yad Labanim to enjoy a local ride along a familiar route. The usual suspects tried to liberate as many Passiflora as they could, although Frederic has hung up his filching gloves and joined the more respectable majority!! Well, it wasn't exactly midday - but it is mad to go out in the sun to cycle 30 km for fun ..... isn't it?? Before I begin the write-up of this weeks ride, let me take this opportunity to offer our condolences to the families of the cyclists who were killed and best wishes for a speedy recovery to those that were injured on Saturday morning. Unfortunately, all the safety measures in the world can not protect us from irresponsible drivers. 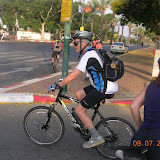 Fourteen of us set off at 7 AM from Elishema for a familiar, yet very pleasant ride along the Yarkon and Southeast towards Rosh Ha'ayin. When we reached our first water crossing, Ingride made her usual splash and some really rude people laughed at her plight. Frances and Anna were so intimidated, they scooted off looking for a drier place to cross and got lost - or at least got separated from the pack. They managed to find their way to Einat and met up with us at the gas station for coffee. 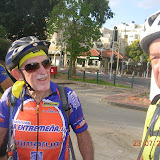 Errol, a road biker friend from Hod Hasharon, joined us for coffee before making his way back to the pavement. David, returned to ride with Cyclenix after a "short" break in cycling - WELCOME! Hylton stopped in the middle of the path along the way, almost causing a huge collision and when we finished uttering a few words that sailors would blush saying, we rode on. We then found out that Hylton's abrupt stop was because he found a cellphone in the path, which turned out to be David's!!!! Great luck for David and kudos to Hylton for his sharp vision. The weather was overcast, so the sun was not too strong and there was a nice headwind cooling us down along the way. We chose to return on the shortest route possible in order to avoid the oncoming heat of the day. We passed through one sewage smelling waterway on the way back, got our feet wet, but made no splashes. The ride was 31 kms of easy riding and quite pleasant with some shaded paths along the way. Upon arriving back at the cars, some members of the group were surprised to see a pair of naked legs protruding from under Frances' car - I guess some people just never grow up! 11 of us gathered in the already hot morning air at Yad Labanim to set off towards the sea on one of our familiar routes. We arrived at the lookout over the blue ocean without too many sandy patches. And in the tranquil surroundings, up popped Avi, making us 12. It transpires that he had already been cycling around the countryside and came to join us to extend his trip a bit. There's really not much to write about. 13 (a lucky number) of us met at our usual meeting spot in Ra'anana. The weather was hot, but not too hot and we set of on a route we have ridden many times. It's not the route that makes the ride. It's the "being together with nice people" that's the all-impotant thing about our rides. 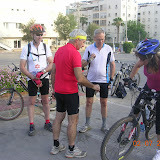 We rode through the Ra'anana Industrial area and on to Bazra turning North at the entrance to Bnei Tzion. We made our way to Udim and then headed back to the SI Gas Station just passed Gaash, which seems to have become on of our favourite stops. It's never too crowded and the food and service is good. Thereafter it was back to Ra'anana. We were home not too late and I think we all enjoyed another 30 kilometres of being together doing our favourite thing! Over a decade ago when we first rode in Ben Shemen Forest we would park our cars anywhere on a Sat morning at 7AM. Now it's a different story. They come in droves and often resemble an army of ancient warriors with their protective riding gear and face guards. They sweat and pant as they occupy almost every path and single track and push each other to perform faster and closer to the edge. What a revolution has taken place in such a short time. The array of bike types abound as each rider male or female seeks to be a "one off". Individualism is almost a religion with unlike gear and sundry equipment prerequisite. And today we almost ran into a horse rider or was it he into us? The place is one of several off road riding Meccas which is why we also went there today. The hills and winding paths, the tree cover and the vast array of trail options and it's location contribute to its reputation and we can all say after a great ride that Ben Shemen is indeed worthy of its reputation. Our ride today, GPS plotted and led by David, was quite different to past B.S. rides although some of us had ridden on some of the sections before. David and Ingride's daughter Simoma who has not ridden in ages needed to get into stride but once she got herself on track there was no stopping her. She had great support from her friend Or, a competent rider and she was all smiles by the end of the ride as were all 17 of us who were lucky to be there today on a comparatively cool and overcast summer day. We enjoyed at least two scenic points and had our share of up-hills but it was as perfect a day as could be in one of our favourite riding spots (despite Eli's near miss). Special thanks to David and a special mention to Sharon for the most improved rider. 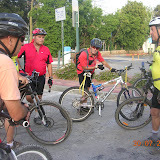 Sixteen of us courageous cyclists decided to brave the hot and humid weather conditions and turned up in Ra'anana at 7 AM to begin our sojourn. I must say, I was quite surprised that so many people showed up. It just shows how we have acclimated to Israel over the years and are more willing to put up with the ferocious sun than a few drops of rain in the winter (myself included). It was a boring ride - the avocados are not yet ripe, the corn was not yet ripe, the passiflora was not yet ripe.... You would think someone knew I was coming. 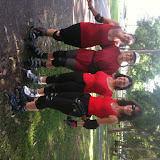 Actually, the ride was quite nice - we kept up a steady pace, hoping to beat the heat. We rode along one of our usual routes (Rishpon, Yakum, Udim, Rishpon). There was a bit of sand along the way, but it was rideable.We were able to ride across the gorge in Udim for the first time in more than a year!! We even managed to find a little mud and it mucked up our shoes and bikes - you know the kind that weighs a ton and just does not want to come off. No punctures, but France's tire tried to escape. The little bugger was quickly caught and returned to his rim. Half the group got lost at one point, but we met up again about 20 minutes down the line. Refreshments at our filling station at Ga'ash, where we drove the waiters and waitresses crazy by NOT LISTENING when they brought our orders. Ted led a toast in honor of our esteemed leader's birthday - CONGRATULATIONS to David! It was then a quick ride home from there and into a nice cool shower. About 36 km of pretty easy riding (except for the heat) and it was actually a lot cooler when we were riding than when we stopped. I want to ride my bicycle I want to ride my bike (compliments of Queen) and we all did. A group of stalwarts set off from Yad Lebanim on what promised to be a hot, hot day. We kept up a fast pace, led by David, covering familiar routes. 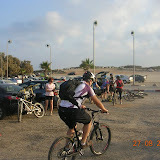 There wasn't too much sand - the scourge of summer - so we mostly managed to stay on two wheels. Only two minor setbacks: two punctures - but these was speedily seen to. We stopped off at our regular stop near Ga'ash, where the food and drink are good and the service is friendly. 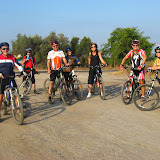 All in all, a good 35km ride enjoyed with good company and temperate heat.